BOONE, Iowa – The fun starts on Sunday, the day before cars start taking serious laps at the 36th annual IMCA Speedway Motors Super Nationals fueled by Ca­sey’s. Complimentary chili and beverages will be served in the pit area after tech inspection and an open practice session on Sept. 2. A repeat performance by country western artist Cody Hicks follows the tailgate party and brings the night before the Nationals to a close. The tech inspection process in place since 2014 will be continued: Beginning at 9 a.m. Sunday, Hobby Stock, and Northern SportMod drivers are encouraged to go to the lineup board behind the pitside grandstand and get their inspec­tion sheets and hard cards as soon as they arrive with their race car. Drivers will be called over the PA system for staging and then sent to the inspec­tion area in groups of 20. Pre-tech for those three divisions runs from 10 a.m.-4 p.m. A $10 pit pass fee will be refunded to everyone who exits the pit area by 4:30 p.m. The open practice session for all divisions is from 5-7 p.m. There is a $10 admission for anyone who did not purchase a pit pass. 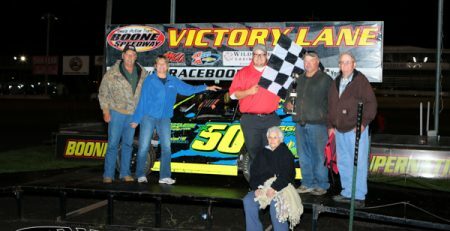 All Modified, Stock Car, Northern SportMod and Hobby Stock drivers pre-entered for Super Nationals are eligible to compete in the Saturday, Sept. 1 Prelude to the Super Nationals at Boone. The Modified feature pays $1,000 to win and is a qualifying event for the 2019 Fast Shafts All-Star Invitational ballot. IMCA Speedway Motors Weekly Racing National and Iowa State points will be awarded in all divisions. Side Biter Chassis North Central Region points go to the Modifieds, EQ Cylinder Heads Northern Region points to the Stock Cars and Big Daddy Race Cars Northern Region points to the Hobby Stocks. Transponders are required in all divisions. Grandstand admission is $20 for adults, $10 for students ages 13-17 and free for kids 12 and under. Pit passes are $30. Pit gates open at 2 p.m. and the grandstand opens at 3 p.m. Hot laps are at 4 p.m. and racing starts at 5 p.m.